The Golden Lion is a family run private hotel nestled in the Welsh countryside right on the Offa's Dyke Path. 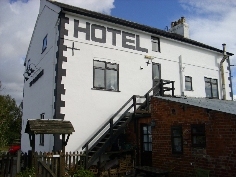 An excellent base to explore the mountains and lakes of north and mid Wales and the Marches. This Georgian grade II listed building is owned by Karen & Rob Cook Williams. We offer spacious, comfortable, affordable accommodation and a good range of home cooked food all year round. Take a look at our special offers page for even more great reasons to book with us. With so much to do in the area you will be spoilt for choice. Enjoy a leisurely stroll along the canal, a boat trip or steam train trip, dirt buggy racing, clay pigeon shooting, horse riding, and many other activities - even guitar tuition! Step back in time with a visit to Powys Castle or the Hill Fort in Oswestry, there are so many heritage sites in the area including the rare Victorian Lime Kiln. There is a great range and variety of shops in historic Shrewsbury and Chester, not forgetting Wrexham too, and the smaller towns of Welshpool and Oswestry right on our doorstep. Whatever your choice of activity or holiday you will be assured of a warm welcome, comfy bed and hearty meal at The Golden Lion Hotel.